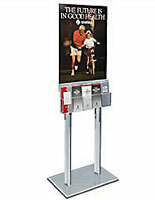 10 Pockets on Each Side for Distribution to Customers. Acrylic Constuction is Lightweight & Lasting. 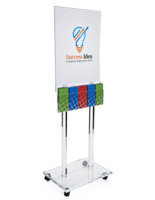 Sign Holder for 22" x 28" Graphics is Double-Sided. 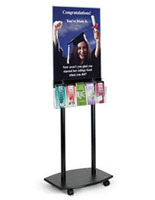 This mobile acrylic pamphlet stand is a freestanding, double-sided literature display that has a total of 20 pockets, 10 a piece on two sides. 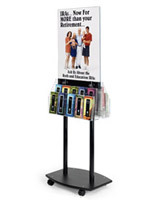 The poster holder will present 22” x 28” images back to back in the same frame and measures 67” high so customers will have graphics at eye level. 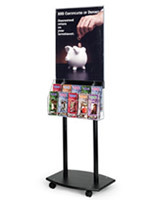 The pamphlet stand with locking casters is a safe and secure way to place brochure pockets in busy customer traffic. 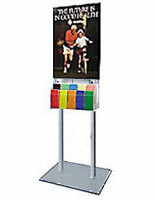 The literature display has removable pegs to allow more than 4” brochures to be placed inside. 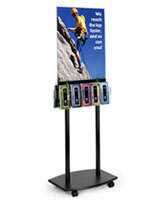 The stand will also display materials that are 8.5” wide. The freestanding poster unit is shipped to customers disassembled, but is very easy to put together with the provided hardware.